We provide comprehensive orthodontic services for children of all ages. Beginning around age 7, we start to screen for signs of malocclusion (misaligned bites) that could result in the need for extensive treatments later on. Addressing those conditions early can help your child enjoy a straighter, healthier smile as they grow up. Did your son or daughter lose a tooth prematurely? Did we have to pull one because of disease? A space maintainer saves room for the adult tooth to come in straight, without the other teeth shifting out of alignment. Is your little one thrusting their tongue forward, causing the front teeth to jet out? These temporary appliances can train them to swallow properly. Our Invisalign Elite Provider has completed thousands of clear braces treatments. With Invisalign Teen, your son or daughter can enjoy “invisible” orthodontics that are removable for easy home care and all of their favorite meals. Conventional braces can help teens and younger children quickly correct tooth misalignment and promote a smile that’s easier to keep clean and healthy as they grow up. From time to time, we may recommend therapies to modify your child’s bite development. This leads to a healthier bite relationship without the need for extensive surgeries years down the road. Many orthodontic problems can be detected early and corrected as your child grows. Why drive all over Bonita Springs looking for an orthodontist when we have one right here in our children’s dental office? 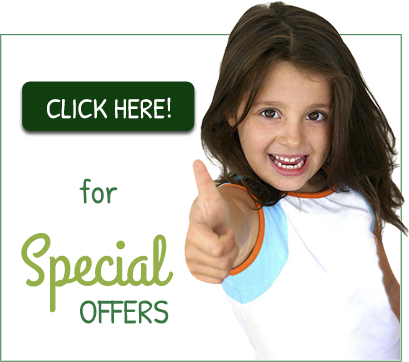 Now it’s easier than ever to get that free consultation or 2nd opinion about your child’s smile. Are your child’s permanent molars or front teeth coming in? Then it’s time to schedule their first orthodontic evaluation. Call us today! Financing plans are available. At our children’s dentist office in Bonita Springs, we only offer white composite fillings to restore your child’s teeth. Special Needs? We Can Help! I am so grateful to this office , I called with an emergency and they got me in the next day. My son is 6 years old and had an abscessed molar. They were able to see him and even extracted it the same day without a second thought. The girls were so caring and attentive to my son, making sure he was comfortable and relaxed. We will definitely be back for his dental care! This is my first review anywhere, and I'm proud to say that it is for Treehouse! My 5-year-old literally went from hating the dentist to wanting to be one after just two visits!! After enduring a painstaking root canal and terrible bedside manners at a major competitor, we knew that Treehouse truly cared about my son, and even performed his final root canal successfully with zero issues and in no time at all! They even saved us a fortune by avoiding anesthesia. My family (and wallet) thank you!!! Just an FYI I just had two clients in my salon this morning who both said they love this practice and it was very affordable. My son needed a dentist this morning and I picked another dentist bc of the review that was left here. When I got to work and told my clients they were both shocked bc both of their two children see dentists at tree house and they all love it. Hope this helps any one else who may turn this place down. I wouldn't have had I asked clients at the salon first!